On the evening of 22 July 2016 I took part in Littoral Light, a light and sound art event on the beach at Ramsgate in Kent. Hundreds of people came. My work was a sound art installation using the natural reverberation of a sea cave. My sound work ‘Otomluna’ was created for this event. I enjoyed being involved in this event at Turner Contemporary, as a member of Athelstan Sound Ensemble providing accompaniment to the dancers. On Saturday May 9, Athelstan Sound, with myself on aionophone, were the support act for Christopher Brett Bailey at the Tom Thumb Theatre, Margate. 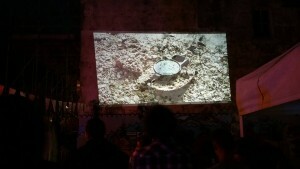 We played live to a screening of my film ‘Crow Sea’ with audience participation in the form of bird calls. I was pleased to be asked to perform with the aionophone at Free Range City, part of the International Festival of Projections, at the University of Kent on 19 March 2016. Had a great time, did some collective improvisation and made some new friends. My very brief rendition of ‘In the bleak midwinter’ on ukelin was used by the good people of Haeckels in their Christmas message. Thanks Dom Bridges! 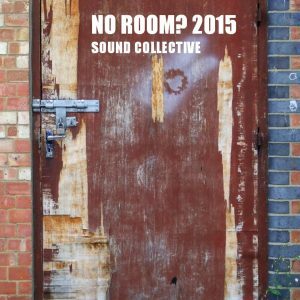 I’m really proud to have been included on this compilation in aid of Shelter just before Christmas, and to have created the sleeve design too. On 22 October I played a duet with Ruth Duckworth on flute, myself on aionophone at Free Range, Mrs Jones Kitchen, Canterbury. From the 28th to the 31st of August my video ‘Crow Sea’ was shown at Resort Studios, Margate as part of the Resort Revue. My video ‘Sounds from darkling beetles’ got an outdoor screening on 14 June as part of the Fort Road Film Festival in Margate. Last week I showed my video/sound work ‘Crow Sea’ at Kymmata, in the O3 Gallery, Oxford. It was a great week of installations, performances and meeting up with old friends. The ‘Crow Sea’ video is now on Vimeo, and the soundtrack is on SoundCloud.